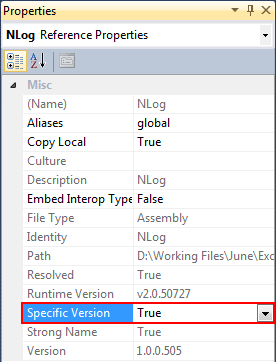 After adding some references to external assemblies like to NLog or Munq I found out that on some projects Visual Studio 2010 had a tendency to drop the reference to some of these assemblies. After the usual searching of Google and Stackoverflow I've put together a combination of different solutions that seems to solve this issue. Step 3: Right click again on the project and click Edit ...csproject. Step 5: Right click on the project and click Reload Project. This works for me so far.